Well it was Thanksgiving , We had a grand meal ,apple pie , the lard crust was close to perfect. It's Calif. and we still have the last of the seasons tomatoes on the porch. No I believe the Pacific will continue to moderate temperatures , at least locally . Yes it is likely continue to dry ... the squeeze of the vise, but I also believe we will on occasion get Big El Niño floods. Perched here on the edge of the continent , as far as we could push west. I think some times of England where I spent a few years of my youth. I think England has changed more , but it has been sixty years from my last visit. The persistently high missing number is what concerns me. You would think that family members and friends would have been able to reach each other by now. I concur that the large number of (remaining) missing persons is troubling. A large death toll, unfortunately, is what I expected when I read the fire was advancing 80 acres (32 ha) per minute on Nov. 8. Considering that the town was a favorite spot for many elderly and disabled people, the geography, the speed of the fire, the lack of sufficient escape routes, the quick loss of electricity and cell reception, I think the death toll could have been yet much higher were it not for lots of local heroism and some luck. What amazes me is that it is still burning. The rain was certainly a welcome development - hopefully fire season in California is over for the year. PG&E could face billions of dollars in potential liabilities due to last year’s Wine Country wildfires and the recently contained Camp Fire in Butte County — which left at least 88 people dead — casting doubt on whether the state’s largest utility can stay financially viable in the long run. Thousands of Australians have been told to evacuate their homes as powerful bushfires threaten properties in Queensland. The state's fire danger warning has been raised to "catastrophic" - the highest level - for the first time. The worst threat is from a fast-moving bushfire near the town of Gracemere, said Premier Annastacia Palaszczuk. Authorities have ordered about 8,000 people in the town and its surrounding areas to evacuate immediately. The region has been experiencing a record-breaking heatwave, with temperatures soaring above 40C (104F) in places. debris flows possible (again) with approximately 1.3" (30 mm) of new rainfall forecast. also: mobilized ash has clogged some drains in the area, causing water damage to buildings. Bushfires are a normal part of Australian climate. They often rage across vast stretches of the thinly populated Outback. Australia’s bushfires pose the greatest threat to life and property when they rip across the more heavily vegetated and populated areas of southeast and far eastern Australia, and especially when they hit communities on the wildland-urban interface. Here, they can be every bit as deadly and destructive as the worst California wildfires. According to Geoscience Australia, major bushfires from 1967 to 2013 caused 433 deaths, 8000 injuries, and some $4.7 billion in damage (2013 Australian dollars, roughly equal to $5 billion in 2018 USD). If this were scaled up to the U.S. population, it would represent more than 5000 deaths and 100,000 injuries. Since southern Queenland gets much of its moisture during summer, its fire season tends to be most intense from spring into early summer, so this week’s fires are on target in terms of seasonality. One thing helping to make these fires so fierce and widespread is an intense drought that’s parched the landscape in recent months across much of eastern Australia. In turn, this year's drought falls on the heels of six abnormally dry years across the region. A special report (see PDF) from the nation’s Bureau of Meteorology (BOM) concluded that “the recent dry conditions in eastern Australia have few precedents for their combination of extent and duration.” In many locations, the six-year dryness is comparable only to multi-year droughts in the late 1960s and from the mid-1920s to mid-1930s. Camp Fire (Paradise, CA) Wikipedia update has good news: death toll decreased! and number of missing way down. Looks like fewer than 100 people were killed, all told. Also posted in the AGW > Policy & Solutions > Insurance thread. Oh dear. 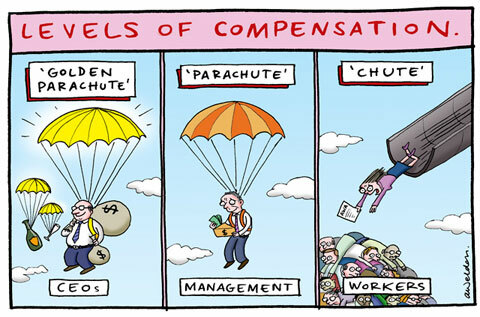 Such concentration of local risk beyond the ability to pay should not be allowed with proper regulation, unless the company has a reinsurance policy. Some countries also have a fund, paid into by all insurance companies, to cover such eventualities. In the USA? Don't know but rather doubt it. Even Lloyd's of London, where underwriters were at risk of personal bankruptcy in such circumstances, now have a backstop to limit their liability. I'm sure that the board, as well as all of the major stockholders, will dig as deeply as necessary into their personal coffers to see to it that those who entrusted their future to them will be made whole. Anyone suggesting less is a communist sympathizer intent on undermining our faith in American Capitalism. California has one. See the wiki article Tor linked to above. The number of missing is down to 6, with no increase in deaths (85), per Wikipedia. Perhaps fire fighters should be required to stay on the job, rather than sending equipment and personnel to attend police funeral processions? He said the figures released in connection with the three wildfires—the Camp Fire, The Woolsey Fire and the Hill Fire— are preliminary. ... When Serene Buhrz turned the water on for the first time several days after the fire, the chemical smell from their kitchen tap was overpowering. For nearly a year after the fire, Fountaingrove residents were told not to drink water from the tap, even if it was boiled first. ... In total, the City of Santa Rosa had to spend $8 million replacing hydrants, valves, and other water system components in 352 properties, including 1,265 feet of water main. According to U.S. Forest Service data, in just 20 years, new wildland-urban interface (WUI) areas grew by more than 46 million acres, covering an area larger than Washington State. This is what will happen in the ocean when the waves drown Miami and other coastal cities. Widespread long-lasting pollution. People may retreat to higher ground, but their infrastructure will not. Exactly! This is what I've been telling my town council. Unfortunately, they're still acting like they live in the 20th century. A mudslide forced the closure of Pacific Coast Highway in Malibu Saturday as a flash flood warning remained in effect for areas in both Los Angeles and Ventura counties where hillsides have been left denuded by the recent Woolsey and Hill fires, authorities said. ... A mud flow on Pacific Coast Highway near Mullholland Highway in Malibu trapped two cars in mud, according to the CHP. Both directions of travel were shut between Las Posas Road and Encinal Canyon Road as crews cleaned up the mess. The closure was expected to last through at least Sunday, according to Caltrans. Another mudslide covered all lanes of traffic along PCH near Tonga Street in Ventura County, prompting a road closure, CHP logs showed. Those living in the recently burned areas are urged to take steps to protect their property, remain alert an follow any directions given by emergency responders. "Mr. President -- Just yesterday, @OregonGovBrown, @GovInslee, and I sent a letter asking the federal government to work with us in taking on these unprecedented wildfires. We have been put in office by the voters to get things done, not to play games with lives." A federal judge tells PG&E to cut down or trim all trees that might fall on power lines. PG&E has until Jan. 30th to respond. Gavin Newsom , our new governor , is apparently making the PG&E problems a priority in his new administration. Seems to me that there is a conflict between the new green governors credentials and federal judges proposal to cut down tens of thousands of trees. I am buying a tesla power wall because I think our PG&E power grid and intermittent power are inevitable. 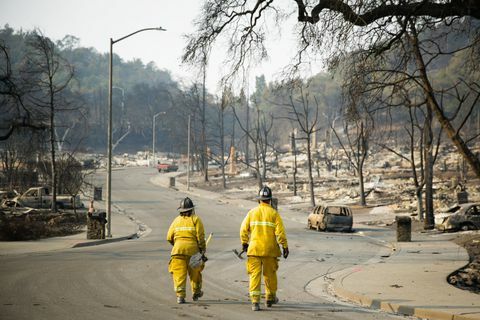 Brian Chappatta: "BREAKING: PG&E downgraded to junk by Moody's (Ba3 from Baa2). Company is officially a fallen angel." "We see a much more challenging environment for PG&E, as potential liabilities grow, liquidity reserves decline and access to capital becomes more uncertain. The company is increasingly reliant on extraordinary intervention by legislators and regulators." ... The company has seen two-thirds of its market value wiped out since November’s Camp Fire -- the deadliest wildfire in California’s history. Investigators have been probing whether the power giant’s equipment ignited the fire, along with its potential liability for blazes that devastated Northern California’s wine country in 2017 -- costs that may tally as much as $30 billion. Its debt has been downgraded to junk and state regulators have called for a management shakeup. The company’s deepening financial crisis has forced California regulators and policy makers to consider a bailout package and PG&E is weighing whether to file for bankruptcy. The utility is planning to notify employees as soon as Monday that it may make a Chapter 11 filing within 15 days, people familiar with the plan said Saturday. Such a notice would be required by state law. ... The board of directors of Pacific Gas and Electric (PG&E) has determined that the move “is ultimately the only viable option to restore PG&E’s financial stability to fund ongoing operations and provide safe service to customers”, the San Francisco-based company stated in a filing at the Security and Exchange Commission. Great summation of this whole PG&E disaster. "This change has been cooking for a long time, but the first time we realised something wrong was happening were the years 2009 and 2012," he said, referring to the Black Saturday bushfires in the Australian state of Victoria that killed 173 people and wildfires in Spain, Portugal, Chile and California, US. Many in the fire community initially thought these were just abnormal events, he says. But then wildfires in Chile and Portugal in 2017 indicated that those weren't simply extreme years. "That was the new normal arriving. 2018 has confirmed that," he said, referring to the deadly wildfires in Greece and in California. In the past, he says, a fire that destroyed 25,000 hectares a day was considered extreme. According to his figures, the October fires in Portugal consumed 220,000 hectares of forest, an area 22 times the size of Lisbon and killed more than 40 people. Castellnou says that at their peak, wildfires burned at a rate of 10,000 hectares per hour over seven hours. "This is something that blew my mind and I cannot use technology to simulate that because models can't predict it,"
Audio: The first 2 hours of radio traffic from the Paradise, California wildfire, starting from the initial dispatch. The fire begins near Pulga, in the upper right of the map below, spreading quickly to Concow, then Paradise. A forest fire in southwest Chin has killed 30 firefighters who became trapped after a sudden change in wind direction created a “huge fireball”, state media reported on Monday. The firefighters had been reported missing on Sunday while fighting the blaze in a remote, mountainous part of Liangshan prefecture in Sichuan province. The became trapped after the wind abruptly changed direction, before they lost contact with other rescuers and were engulfed in flames. The emergency ministry confirmed the following day that it had found the bodies of all 30 missing, China Central Television reported. The blaze had still not been brought under control on Monday evening, and efforts to tackle the fire continued.